Note: This article is by no means the “definitive” article on Struck dozers. The information contained in the article has been gleaned from brochures, web articles and price lists. Struck dozers were not manufactured like new car models; they would phase out one model and introduce other models over time. You’ll also notice in several places I have question marks (???) for dates. I’m also not sure of all my statements concerning availability of kits and assembled vehicles. The information was collected because I was just curious. If anyone with more knowledge than me reading this article will contact me, I will gladly acknowledge your help and make any changes. C. F. Struck Corporation of Cedarburg, WI has been manufacturing small dozers since 1967. They manufacture a small, personal dozer that can do many of the jobs of a much larger dozer if you’re not in a big hurry. 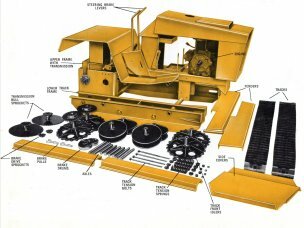 If you’re old enough you may still remember the advertisements in several magazines for a dozer kit that you put together yourself. 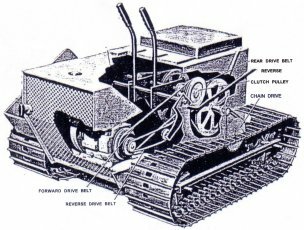 The first mini-dozer (MD) was the MD34 which was an all belt-driven dozer except for the final chain drive. The picture on the left was taken from an assembly manual. The picture on the right is an MD34 owned by my neighbor. He has promised to call me when he gets it out of his barn so I can get some better pictures. The MD34 had a 6” wide single chain track with agricultural, detachable type links. You could buy the dozer assembled, as a kit, or any part you wanted to purchase separately. The plans even included a blueprint for a plywood body for the money conscious home owner. 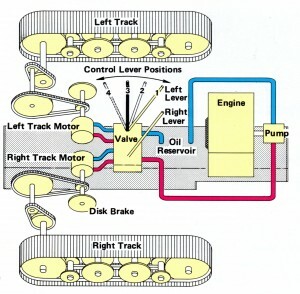 The MD34 had a dual belt system driven off the engine. There was a forward drive belt and a reverse drive belt. A hand lever on the left side applied tension to the appropriate belt depending on the direction the operator wanted to go. 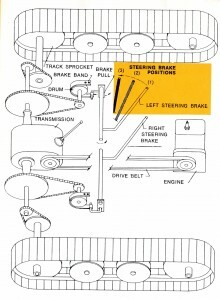 Both belts were connected to a power shaft which was used to belt drive a main drive pulley for each track. Steering levers applied tension to the v-belts that connected the power shaft to each main drive pulley. 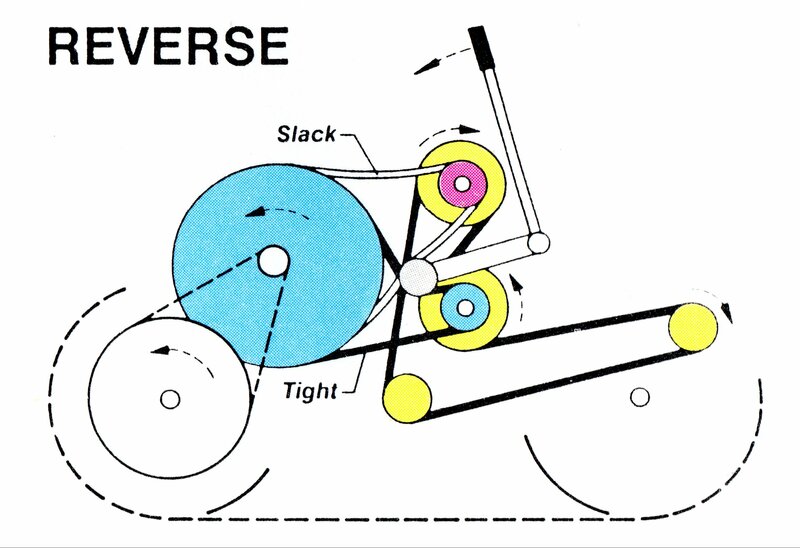 Applying tension to only one drive pulley provided steering. 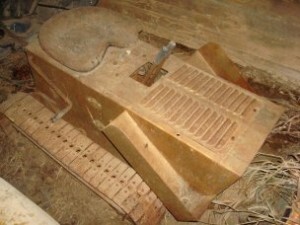 The hand lever returned to the neutral position when released. Since the dozer came as a kit, the owner could install an engine of his/her own choosing. Because of the success of the MD34, it was followed by the MD40 (detachable, agricultural type chain track), MD45 (CA550 roller chain track), Md50, and Md55. Each model had refinements and improvements over the preceding model. A major characteristic of these early series was that the operator basically sat “level” with the top of the dozer hood. The MD34, MD40 and MD 45 had footwells while the MD50 and MD55 had fenders that doubled as footrests. 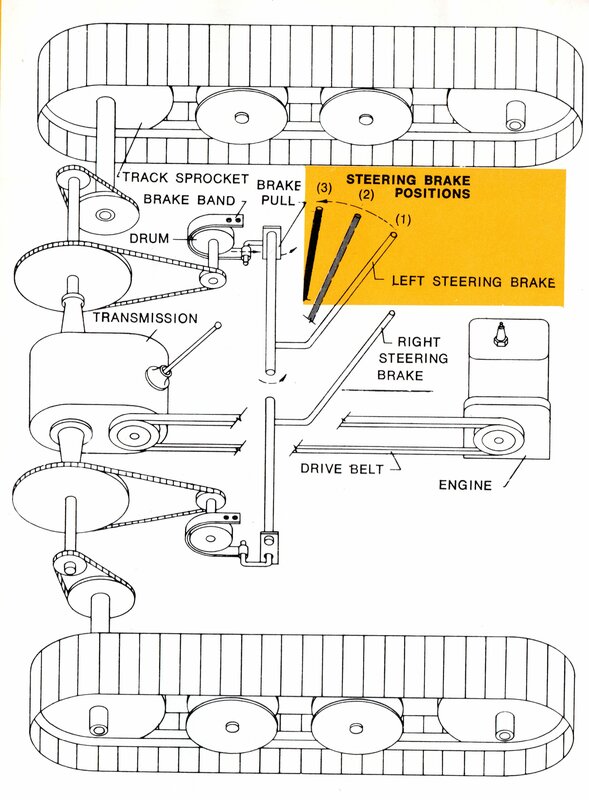 All models were belt driven with the exception of the chain to the final drive. 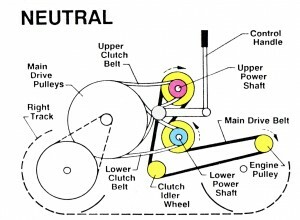 Notice in the picture that in the neutral position the control handle permits slack in both the upper and lower clutch belts. The belt from the engine rotates the upper power shaft in a clockwise direction and the lower power shaft in a counterclockwise direction. There was a main drive pulley and clutch belt for each track. 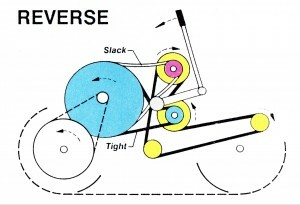 Turning was accomplished by applying power to only one drive pulley. 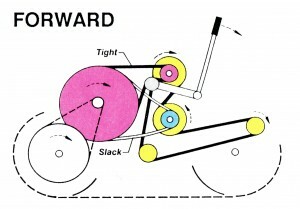 For forward motion, the control handle is used to tighten the tension on the upper clutch belts. And, for reverse motion, the control handle loosens the tension on the upper clutch belts and tightens the tension on the lower clutch belts. In 1972, Struck introduced the Model MD1200 and MD1600. These models were manufactured until 1986 and could still only be purchased in kit form. The MD1200 had 1 forward and 1 reverse speed and a 12hp Tecumseh engine. The MD1600 had 2 forward speeds and 1 reverse speed and a 16 hp Tecumseh engine. Both models had a 6” wide, single chain track. 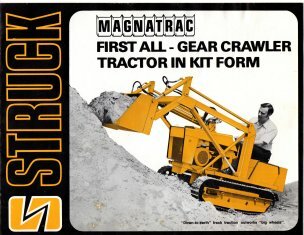 Struck introduced the MT “Magna Trac” series in 1975. The MT1800 was manufactured from 1975 to 1981. The MT2000 was produced from 1976 to 1983. 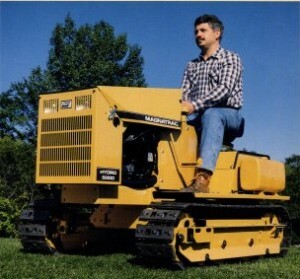 These two models more closely resembled the conventional dozer with the operator’s seat located at a level below the top of the hood. Both these Magnatracs had a Peerless 2338 transmission with 4 forward speeds and 1 reverse speed. Clutch action was provided by an idler pulley tightening a belt between the engine and transmission. The clutch belt was the only belt in the drivetrain and everything else was chain driven. 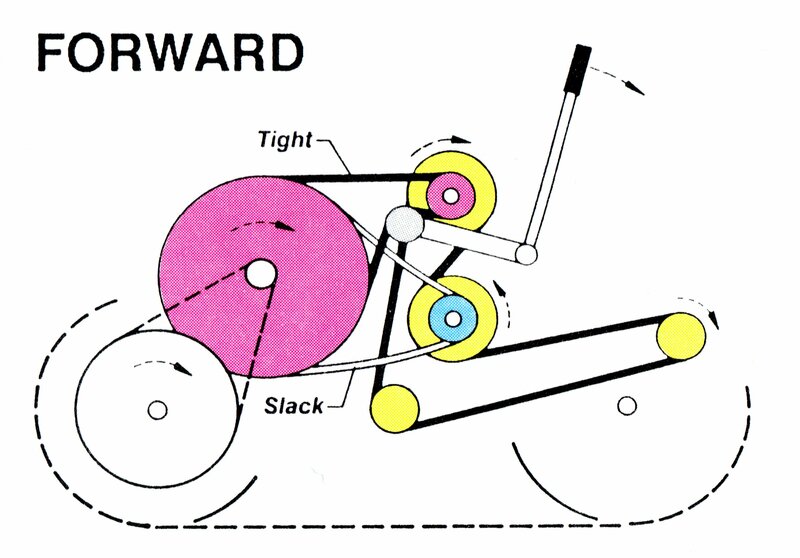 Turning was accomplished by braking either rear axle. The MT1800 had a 16 hp Tecumseh engine with a 6 inch wide, single chain track. The MT2000 had a 16 hp Tecumseh engine and was the first Struck manufactured dozer with a 9 ½ inch, double chain track. Both tractors were still sold in kit form. I was fortunate enough to locate and purchase an MT2000 in 1998. It had been used at a sawmill operation so it showed a lot of wear and previous owner “modification.” With my son’s help we completely disassembled the entire dozer and rebuilt it from the ground up. It has proven to be a very useful machine in warm and cold weather. In 198?, Struck introduced its next dozer in the MT line, the MT3000. The MT3000 featured a gear, chain drive combination and was produced from 198? to 1993. It was equipped with an 18 hp Briggs and Stratton engine and the 9 ½” double chain track. In 19?? Struck introduced its first line of hydraulic drive dozers (Magnatrac Hydraulic)–the MH4000A, MH4000B and the MH5000. 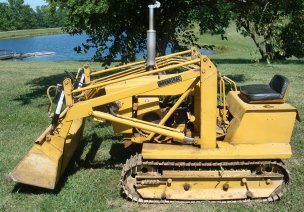 These dozers could be purchased as a kit or preassembled and tested. The MH4000A featured a 11 hp Kohler engine and a 6” wide, single chain track. The MH4000B had a 14 hp Kohler engine, and the MH5000B featured a 20 hp Kohler, “V” twin engine. Both had a 9” wide, double chain track. They were produced from 19?? To 19??. 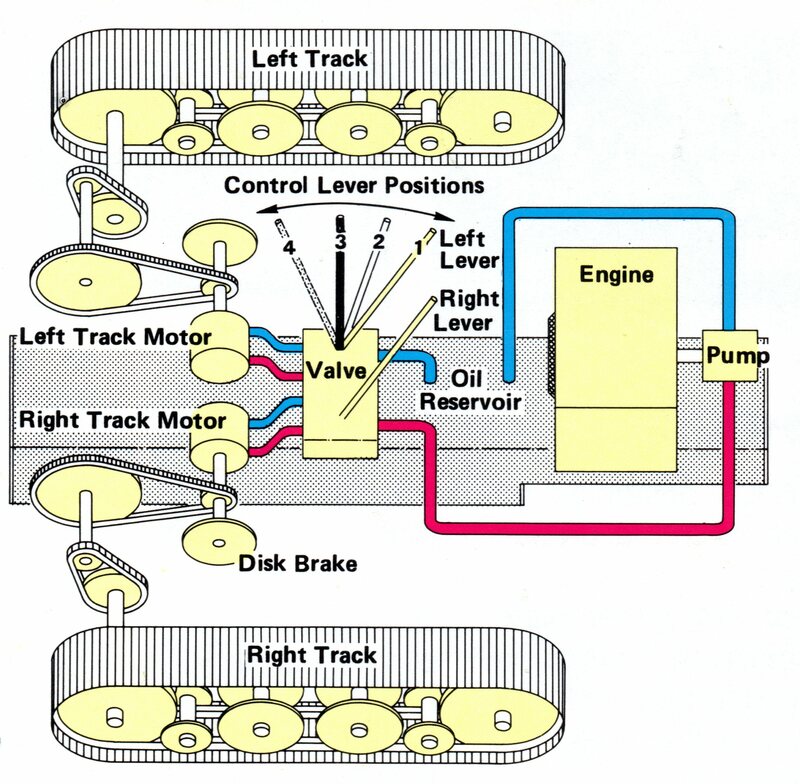 Steering was accomplished by a valve system controlling a hydraulic motor for each track. C. F. Struck Corporation is still in business and still selling dozers. There current offerings include the RS1000 “mechanical drive”, MH8000 “hydraulic drive”, and the RS196K (DIY Kit) dozers. 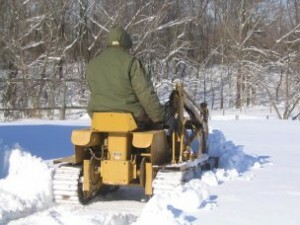 They still offer support on several of the older model dozers. In addition to the basic dozer, Struck offers attachments such as front end loaders, rippers, blades and backhoes. They make a great product for the homeowner that wants a dozer for his or her personal use. As mentioned in the note at the beginning of this article, if you can furnish me with any corrections or additional information, please contact me through this website. I’d be glad to hear from you.